The Starboard Sprint racing board has been designed for flatwater. It has been improved for this season 2019 to use it on open water conditions. Amazing performance on the sea. This Starboard racing board is made with the Carbon Sandwich technology, the top one of the brand. The design was made for flatwater althought for 2019, the Starboard designers have improved the construction of the board, adding some volume in the nose and setting a raised tail for the 14' board to help the riders with the buoy turns and the surfing conditions. Some of the Starboard team riders choose this board to compete in open water race when conditions are not heavy, for example, Michael Booth won the EuroTour 2018 with a Sprint 21.5" board. Its shape provides instant acceleration with the highest cruise speed and amazing top end speed. A raised rail profile makes more pop in flat water and more control in chop. The key features of this board are: dug out rails, efficient drainage system, refined nose shape with optimized nose volume. Thicker profile and sloped tail with a flatter tail concave. All these features make the Sprint, the best board for flat and an interesting board for open water depending on where you use to go paddling. Rider weight: 50 - 95 kgs. How to choose the Starboard Sprint board that best suits your needs? 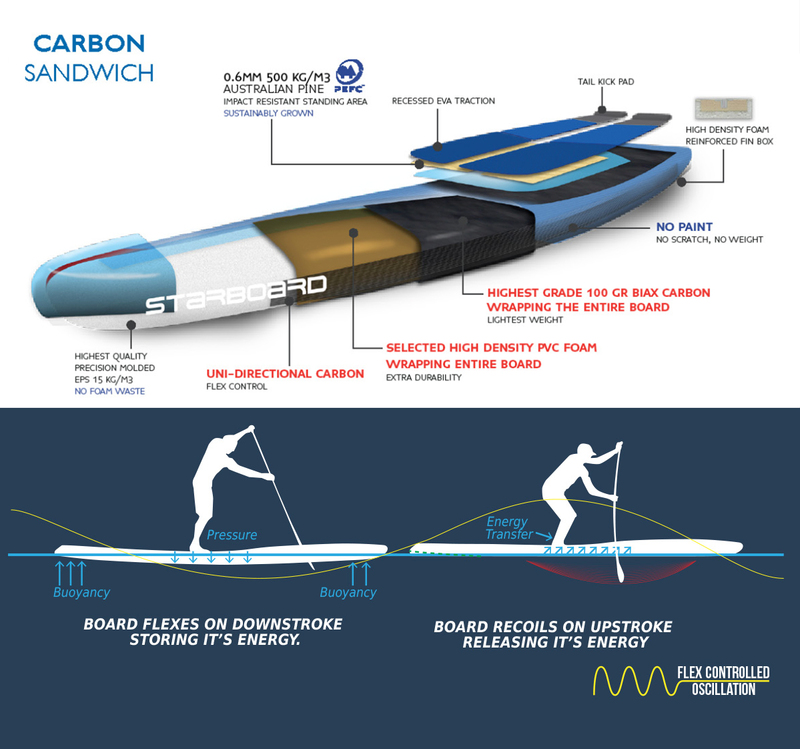 Las tablas con tecnología Carbon Sandwich de Starboard se usan en la gama Race de gama alta.